At Christmas the memories of my childhood Growin’ Up in Maine come flooding back including the happiness being in a family of 8 children on this special day. 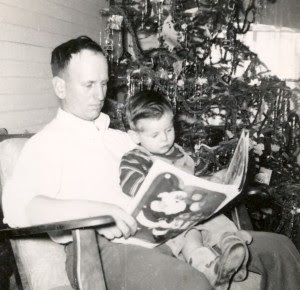 The photograph is me at 2-1/2 years old shown sitting with my Dad around 1951 when I was the youngest of the first 5 children, and he’s reading Twas the Night Before Christmas. This poem, also named “A Visit from St. Nicholas” is a Christmas Eve tradition, and was written by Clement Clarke Moore in 1822. Adding to this memory of Maine in a special way, I’ve recorded this poem so readers can hear my voice reading Twas the Night Before Christmas on an mp3 audio instead of just viewing it. It runs just over 4 minutes, and was done in one take. Enjoy. Did you notice the cowboy boots in the photo? Haha. Now that I do not remember.